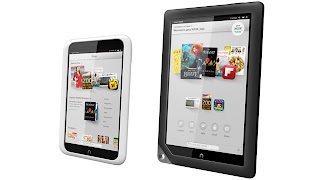 Nook HD and Nook HD+ go for sale in the U.K.
For all the tablet shoppers in the U.K., Barnes & Noble's Nook HD and Nook HD+ Tablets have been launched and have been made available in the U.K. stores for sale. You can buy it from any retail stores or directly online from B&N. As we had discussed earlier in September, these tablets made their debut and are definitely expected to give stiff competition to the newly released tablets by Apple, Amazon and Google. The Nook HD is the smaller of the two tabs, it sports a 7-inch display with 1,440 x 900 resolution, a dual-core 1.3GHz TI OMAP 4470 processor, 8/16GB internal storage, and microSD support. The larger Nook HD+ sports a 9-inch display with 1,920 x 1,280 resolution, a dual-core 1.5GHz TI OMAP 447O processor, 16/32GB internal storage, and the same expandable storage option. Both Nook tablets run a customized Android 4.0 version. The Nook HD and the Nook HD+ will be available at the cost of £159 and £229, respectively. 0 Respones to "Nook HD and Nook HD+ go for sale in the U.K."